The Wirruna 70th Birthday sale results were well beyond that expected. “Given the difficult season experienced across many parts of Australia, and the sell down of the breeding herd putting downward pressure on cattle prices, I was expecting a tough sale”, Ian Locke said. “In the finish the sale exceeded my expectations with strong support of many repeat clients, and a few new ones on the day to sell 90% of the bull offering”. Remote bidders via AuctionsPlus was very evident with 54 registered bidders on-line. 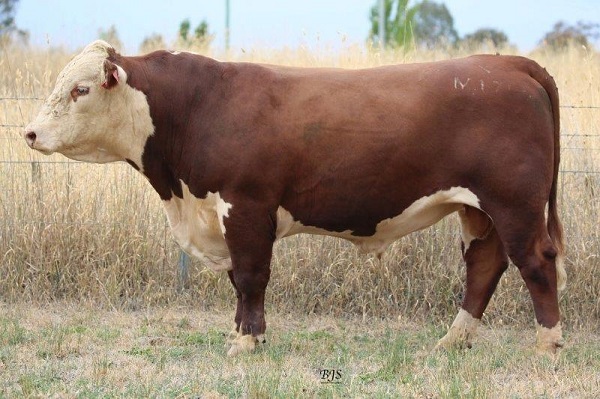 There was strong stud support for various star lots with Oak Downs Poll Herefords, Tarcombe, Alegria, Larnoo, KeWarra & Tarwin Poll Hereford studs picking up some high genetic worth bulls. Homozygous polled Bulls with good calving ease, marbling and high $Index values were in demand. 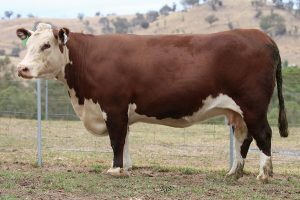 The Wirruna Sires averaged $11,200/hd, and of interest, the Specialist Heifer Bulls averaged $7,000/hd, outstripping the Growth Bulls (@ $6,055/hd) and Muscle Bulls (@ $5,727/hd). Of the sold bulls Homozygous Polled bulls averaged $114/hd greater than the Heterozygous counterparts. The interest in females was a highlight, with all the PTIC breeding females sold to the one purchaser. The Locke family would like to thank all those who supported the sale and thanks to the underbidders for their competition. Wirruna McLaren M175 sold for the top bull price of $16,000 to Andrew & Vanessa Schwarz, Oak Downs Poll Herefords. Wirruna Victoria G92 sold for the top female price of $4,250 to NSW DPI, Menangle.